We recently welcomed a gracious team from One Church in Oklahoma as they made the long trip to join in the ministry here. This time was a bit different from the past as there was a lot more construction going on. Some elements remained the same including continued village outreach and building relationships in the border areas. 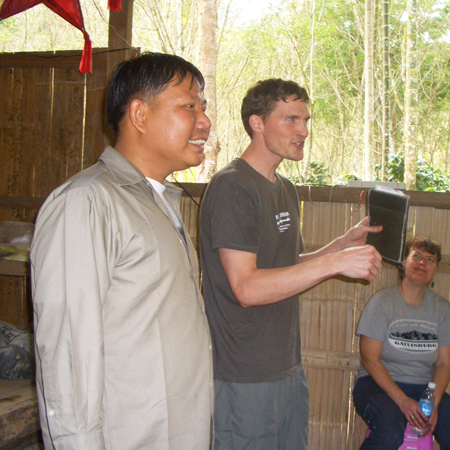 Two of the those areas included Rak Thai and Huey Phu Geng villages where the team ministered to many as they did dramas, songs, testimonies and taught on the love and truth of God. We also visited Tiff’s pastors and local church in Mae Hong Son and joined in a time of prayer and teaching. It was a very encouraging time with so many powerful testimonies! The time spent at Grace House and the Long Neck village was definitely active. In addition to teaching in the local school and providing new play ground equipment, the team and villagers also built ‘keyhole’ gardens for year round produce. The team and villagers also dug a well by hand! This will help a great deal as the village has often lacked adequate water during the dry season. And they installed solar panels for running an electric pump for improving the village water supply. The activities didn’t stop there as the team also gave the villagers their first experience eating American style hamburgers with grilled corn. As some of the kids said, “We have only seen pictures but we have never known the taste.” The kids in turn showed them how to make and eat bamboo sticky rice. Perhaps the greatest highlight for all was simply sharing time with the kids, sharing testimonies and letters, worshiping and making new experiences together. The fellowship of the church with the Holy Spirit remains one of the greatest ongoing miracles. Our focus this year has continued to be on equipping the Shan and Pa-Oh to become leaders within their own group and communities. This is the natural course for making disciples and it has been encouraging to see several of the members respond. Below are a few of our cell groups including three couples that have recently or will be traveling to Burma to witness to their villages. Unfortunately, the end of last year was a period of uncertainty for many of the Pa-Oh within our fellowship. As I’ve mentioned before, the Pa-Oh and Shan come from Burma to find work and a better life. Sadly, they can become targets by people in Thailand looking to exploit them. In this recent case, a construction company has tried to cheat several of the Pa-Oh out of two months of wages. As they have sought legal help and submitted a claim with the government, it’s unclear what the result will be. While that is ongoing, they have been looking for new jobs with respectful employers. So please be in prayer for justice, favor in the legal fight, and good jobs as they move forward. Find us on facebook for additional photos, videos and information.